The Sinfonia gives a lovely sounding 30 watts a channel and is powerful enough to run most speakers with an average sensitivity. Typically we recommend Opera loudspeakers as a natural match, also the Audio Physic Tempo 25 or Plus version works very well. Usually available for demo, ask today to hear italian class A purity. 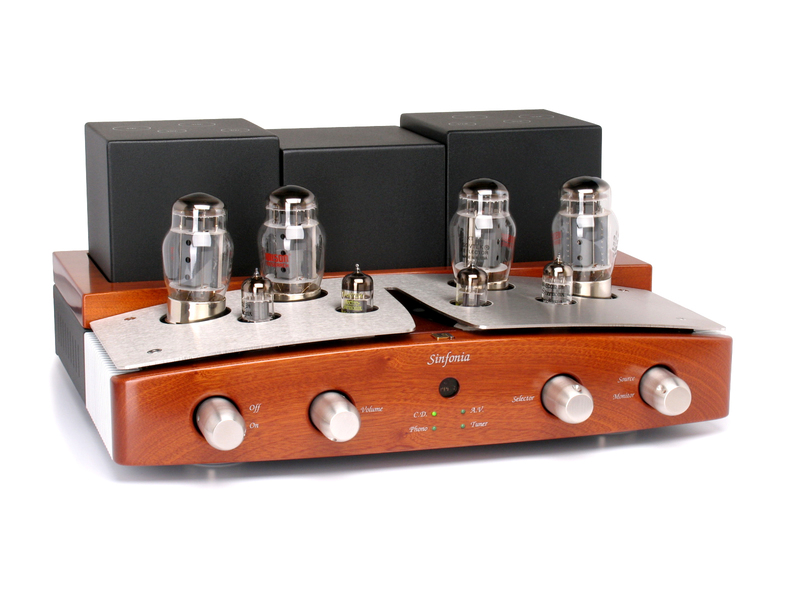 After the acclaim we have received from both audiophiles and the press for our Performance model, we have decided to design and produce a new, smaller valve integrated amplifier called the Sinfonia. 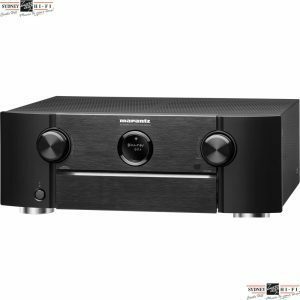 The Sinfonia is very close to the Performance amplifier in both technical characteristics and appearance, but at a lower price. 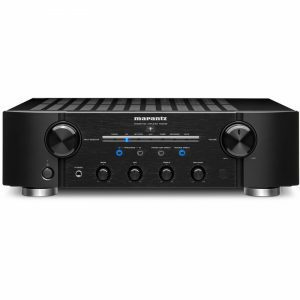 Faithful to Unison.Research tradition, this new amplifier is also an integrated design. We feel that integration offers several advantages both in terms of simplicity of use and attainable sound quality. 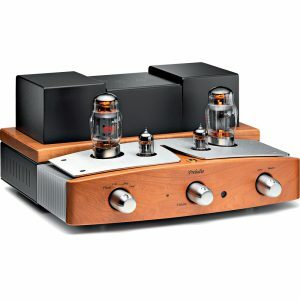 Since an integrated amplifier requires less cabling than its separate counterparts, this allows a substantial reduction of the effect of cable impedance on timbre and dynamics. In addition, there is a significant saving in production costs as well. On the other hand, designing an integrated amplifier is a much more challenging task than designing a separate pre-power combination. For example, we have to carefully consider all the possible interferences between different components and different stages such as the power supply, control, pre-amplification and the output stage. 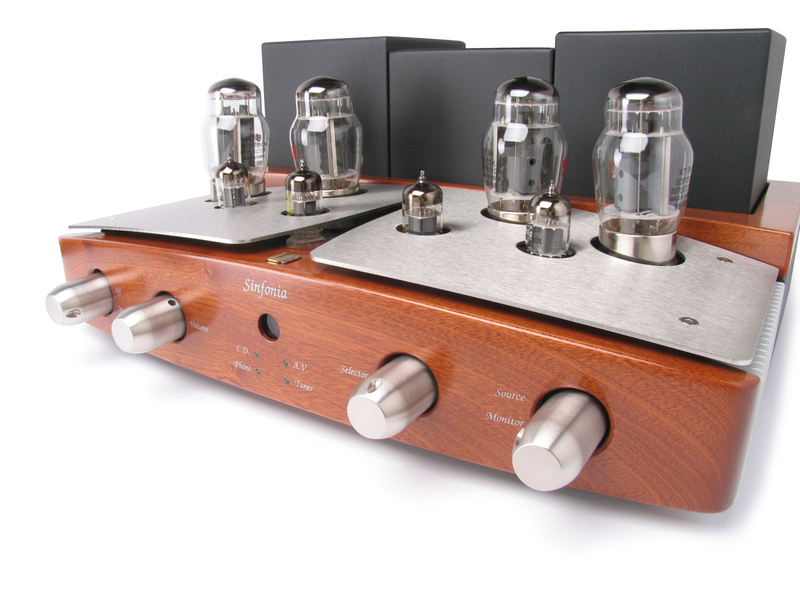 Our experience in the design and production of integrated amplifiers has grown over the years, however, allowing us to create legendary products which are still classics today such as the widely renowned Absolute 845. As we have mentioned, the new Sinfonia is smaller than the Performance and reaches an output power of 27-30W per channel. 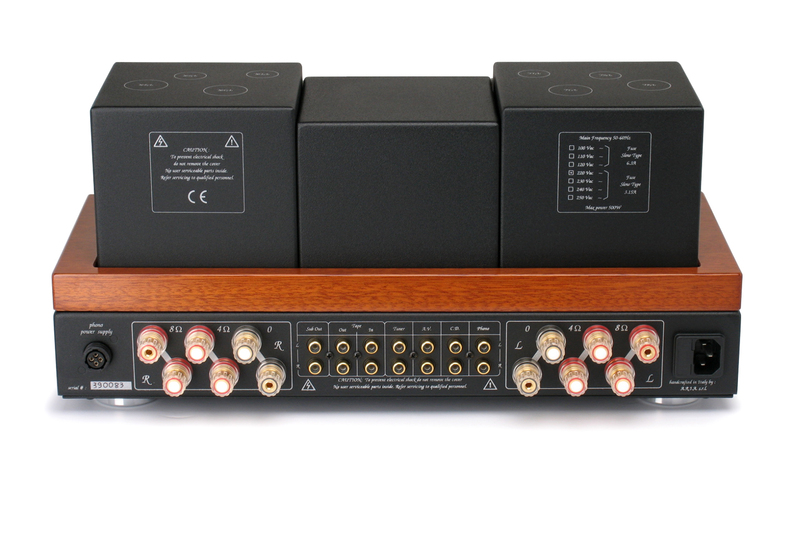 The new model is laid out in dual-mono configuration according to the traditions of high-quality amplification: within a single chassis there are two identical and fully independent amplifiers, a design that prevents any possible electrical or electronic interference between the two channels. 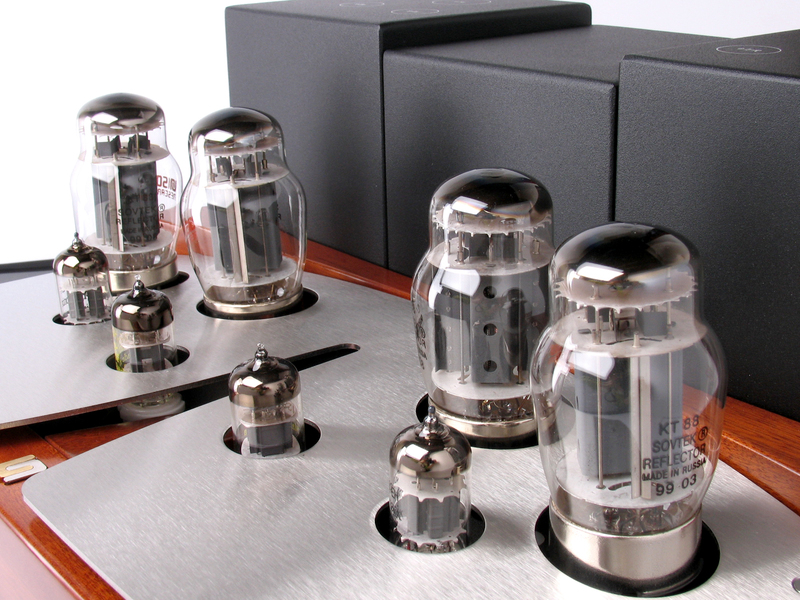 Each amplification stage is entrusted exclusively to valves, and all operate in pure Class A. 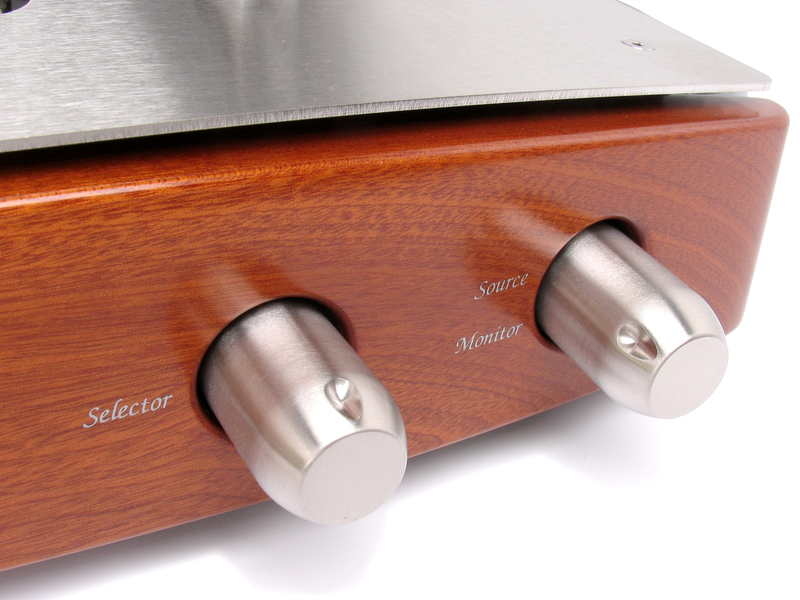 The Sinfonia, like the Performance, is characterized by the presence of two large heat sinks mounted on the sides. These are required by the high voltage stabilized power supply circuits, which are protected by a wide stainless steel cover. The cover material is non-magnetic and has low thermal conductivity; it prevents the heat generated by the four KT88 from reaching the circuits located below. 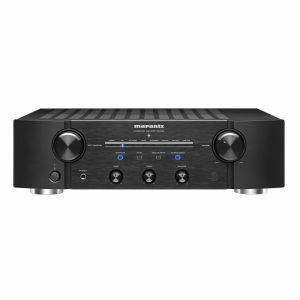 This improves the stability of the amplifier, which in turns affects the sound quality and the overall reliability of the system. Since its beginning, Unison Research has been directly involved in the designing, developing and building of the output transformers for our devices. 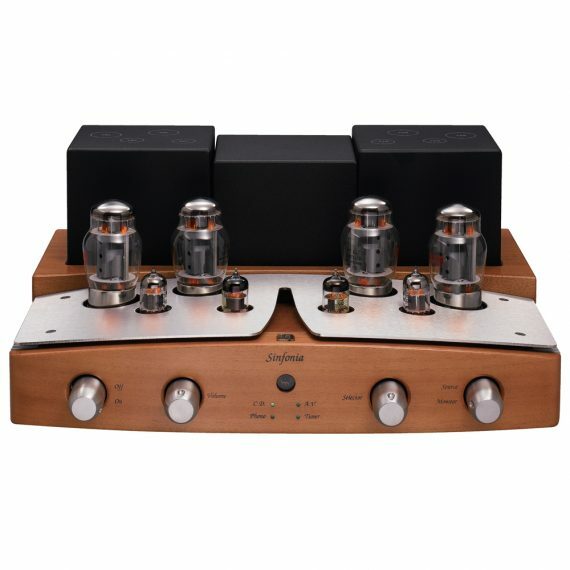 We feel that valve amplifier performance is closely connected to the quality of these complex components. Thanks to a particular design feature of the output transformers, it has been possible to design a power stage for the Preludio that is made up of two KT88 per channel in single-ended parallel ultra-linear configuration, in which the KT88 (beam power tetrodes) operate with good approximation like an ideal triode. Pre-amplification and the power stage drive are based on the double triodes ECC83 and ECC82. These valves guarantee excellent linearity and offer a nearly complete absence of odd order harmonic distortion components. Both the stages are made up of triodes in parallel biased by automatic bias circuits. In this way the output impedance of the two circuits can be slightly reduced, which in turn improves the linearity of the stages. The signal-to-noise ratio and the total harmonic distortion improve significantly as well. Special attention has been dedicated to the design of the output stage which is based, as stated above, on two KT88 tubes connected in parallel. This configuration provides very good results in terms of sound quality, but on the other hand it is extremely critical for rigorous and costly selection and matching of the valve pairs. Moreover, the selection of the valves can only partially solve the problem since the characteristics of the valves themselves change over time in a non-uniform manner due to drift phenomena. After much observation and an in-depth understanding of valve behavior, we have created an original circuit design which, through the control of the KT88 bias, ensures a real time compensation of the parameters affected by drift. This solution guarantees the best sound quality even after many years, and also contributes to a slight reduction in the time it normally takes for the tubes to warm up after switching on and reach the optimal temperature. The direct current on the preamplifier valve filaments is supplied by an interesting circuit configuration: it works by directing the power stage valves cathode current through a parallel regulator which operates like a zener diode to the filament’s terminal. In an audio amplifier, the anodic voltage should ideally be supplied by a battery, but this is obviously not possible for a number of reasons such as high costs, short life-expectancy, large size and weight and more. We considered this problem in depth, and we attempted to obtain a power supply stage whose electrical characteristics were the closest possible to those of a battery bank. We have found an excellent compromise with a special anodic power supply circuit which features an output capacitance that is much higher than usual. The Sinfonia has a microprocessor-based circuit that manages the switching of the input selection and the volume level through the remote IR handset. The analogue volume regulation is operated by a high quality ALPS RK27 stereo motorized potentiometer. 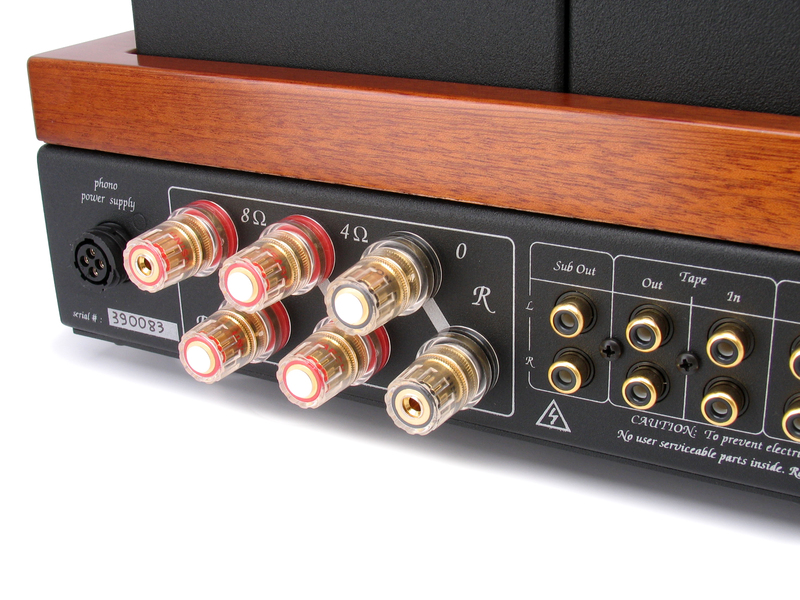 Close to the “tape out” output connector, a low impedance output terminal has been added to allow the connection to an active subwoofer. This output line is connected through the volume potentiometer to the selected input, so it replicates the actual signal present at the pre-amplification stage. A buffer circuit based on operational amplifiers has been added to increase the impedance seen by the signal sources; it avoids the possibility that the connection of the subwoofer could in any way affect the performance of the Sinfonia. 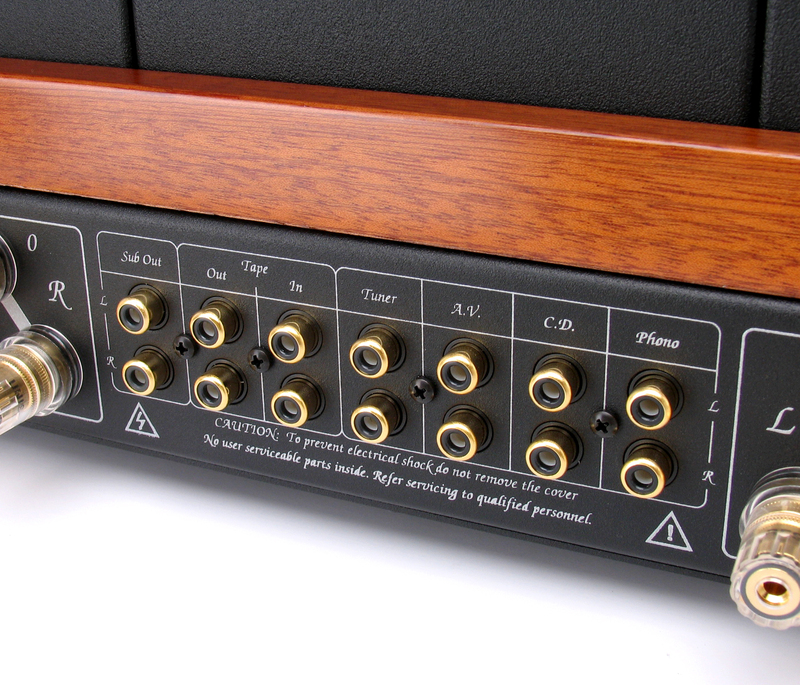 The output terminals are constructed with six gold plated universal connectors, allowing the connection of 4 and 8 Ohm impedance loudspeakers. The input connectors are also high quality and fully gold-plated. In the Sinfonia, nothing has been left to chance, from the choice of components, the control knobs and the wood parts, to the design of the chassis and the circuit boards. Control knobs are machined from solid non-magnetic stainless steel. Thanks to their weight, mass and balance, they provide smooth and precise control when operated manually. The wooden parts, aside from their obvious visual beauty, also play another carefully calculated role: they dampen out induced resonance in the metal chassis. Thanks to this structural damping, the valves themselves, which like all vacuum tube devices are susceptible to microphony, are much less liable to generate unwanted resonance-related effects. 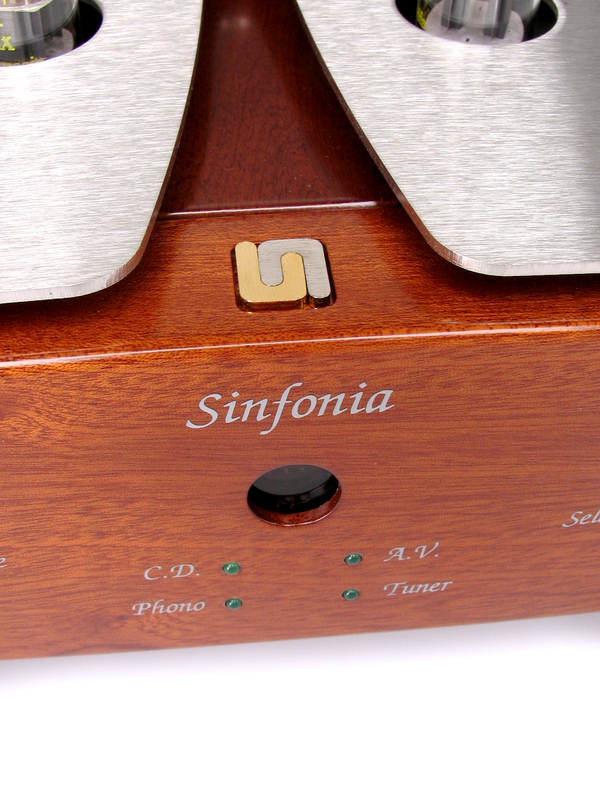 For the best reliability and long term musical quality, all the components used in the Sinfonia have been chosen with care from the non-inductive resistors and the filter capacitors, to the pure ceramic valve bases and the vetronite printed boards. The dimensions, distribution and lay out of the PCBs have been accurately studied and optimized to limit electrical disturbances and prevent components from overheating.